This guesthouse is quite a charming place in a small, green street. The rooms are mostly equipped with fans or air-con and a western bath at around US$ 8-10. Guest have to order their breakfast or dinner in advance, but this’ll soon change. This place is located next to the river. It’s one of the only hotels in town with basic equipment such as air-con, fan, western bath and TV its recommendable. Unfortunately some of the rooms are a bit sticky due to its windowless status. If you want to enjoy your stay ask for one of the rooms with river view or to the back laying rice fields. This guesthouse is located next to the independence monument. It has light and clean rooms equipped with air-con, fan and a western bath. Downstairs you’ll find a restaurant. The prices are around US$ 5-8. 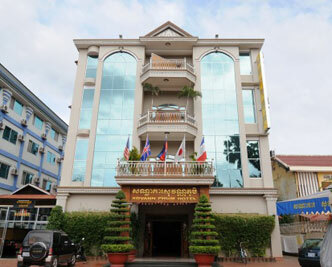 This basic guesthouse is in the Souzhwest of the town centre located. The rooms are clean and equipped with fans and additional bathroom. The prices are reasonable; US$ 5-7. The Half Way House is a restaurant with a pub, which has also bungalows for rent to offer. This is a nice western place run by the amiable Paul, a British-Kenyan that knows the area pretty well. Paul has a Thai wife and lived in Thailand for a number of years. The establishment sees most of it’s business coming from the foreign de-miners and the community based NGO in Kampong Chhnang Province. The place features good pub grub and ice cold drinks. There are also eight, fully, appointed bungalows for rent at US$ 15 per night. More accommodation may be in work.